This holiday season, Red Arrow Diner wants to show our appreciation for all of our dedicated and delightful diners. Everyone on the Red Arrow Diner team is so grateful for your loyalty through the years and we look forward to serving you at the diners each and every day. One way you show your dedication is through our incredible amount of Facebook likes on our flagship Manchester Facebook page – over 29,200 fans! Our holiday wish is to grow our page to 30,000 fans. So we came up with this holiday plan to reach our goal and show our appreciation for ALL of our fans! Introducing The Six-Week Winning Streak! From now through New Year’s Eve, we are on a streak to gain at least 100 new page likes on our original Red Arrow Diner page. 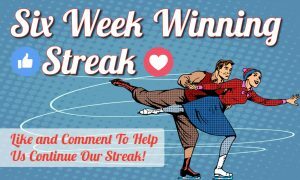 If we reach 100 new page likes each week, we will randomly select winners to receive Red Arrow Diner gift cards in ever-increasing amounts. Our first giveaway on November 26th will be 60 gift cards! But the winning streak is about much more than just giving away gift cards to our customers. If our streak reaches 30k likes for our Red Arrow Diner Facebook page by NYE, we are planning a big donation to a local charity! This is our way to celebrate reaching the goal together by giving back to our community and helping others in need this holiday season. Keep an eye out on the Red Arrow Diner Manchester Facebook page for more details on how you can be #winning along with Red Arrow Diner! No purchase necessary to be entered to win. To be entered to win, participant must like the Red Arrow Diner Manchester Facebook page and like and/or comment on the weekly Six-Week Winning Streak post to be entered to win for that 7-day period. Winners for the preceding 7-day period will be randomly selected on 11/26/18, 12/3/18, 12/10/18, 12/17/18, 12/24/18, and 12/31/18 if the stated conditional thresholds are met. Prize amounts to be announced on the first day of each 7-day period. Winners will be notified via the Facebook page. To claim prize, notified winners must send a private message to the Red Arrow Diner Manchester Facebook page for collection instructions. Failure to follow these rules may lead to disqualification from the contest. Facebook is hereby and completely released of any liability with regards to the administration of this promotion. This promotion is in no way sponsored, endorsed, administered by or associated with Facebook.